Just about four kilometres west of Salzburg′s town centre, you will find Schloss Kleßheim Palace, another Baroque gem of the region surrounded by beautiful gardens and pleasure grounds. Initially, there was only a small court of a regional nobles′ house, the Kleshof. Prince Archbishop Johann Ernst Graf Thun purchased this property in 1690 and ten years later, the builder Fischer von Erlach started to build the pleasure castle "Favorita" in 1700. When Prince Archbishop Thun died in 1709, the building was almost finished. However, Salzburg′s next Prince Archbishop Anton Franz Harrach stopped the construction to concentrate on the re-modelling of Mirabell Castle. Prince Archbishop Firmian, who was also responsible for the construction of Schloss Leopoldskron, eventually finished the job of Schloss Kleßheim around 1723. The final building was a lot plainer than originally planned, however, it remains worthwhile a visit. It consists of three elaborately decorated floors including a beautiful "Festsaal" or ceremonial hall with a huge dome. A terrace in the centre of the main building was built in 1723. Two impressively wide stairways lead up to the main entrance, flanked by deer statues with golden stars in their antlers. The stars are a reference to the coat of arms of Prince Archbishop Firmian. The Baroque park was altered into an "English Garden" (whatever that means, check it out yourself if in doubt) under the reign of Salzburg′s last Prince Archbishop Hieronymus Colloredo. After Salzburg was secularised, Schloss Kleßheim became property of Archduke Ludwig who got the builder Ferstel to erect the so-called "Winterschloss" or "winter castle". However, the best thing about Schloss Kleßheim Palace is the fact that it is owned by the Salzburg Federal Province - which rents it to the state-owned Casino company "Casinos Austria". If you are older than 18, we recommend a visit in the evenings, to enjoy one of the nicest Casino venues in central Europe - and see some decent Baroque architecture at the same time! In some of the side-buildings, Salzburg Province runs a tourism school. 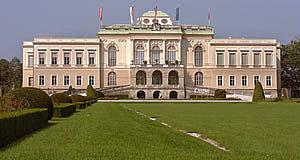 Schloss Kleßheim Palace was also used for a number of movies, some featuring proper stars such as Jack Lemmon, Toni Curtis and Peter Falk.